A-1 Antiques & Porcelain by GK Ltd.
Antiques, oil paintings, rugs, jewelry and collectables. All metals. We can reproduce that piece that broke and was lost years ago. Our Expert Craftsmen together bring a total of 150 years of skill and experience to every restoration. Importer of fine European art, collectables, and select antiques. Rare furniture and antique restoration. Specializing in antique mahogany furniture. Antiques, collectables, antique art and frames. Rebuilding model a,b,t, & v8 and model a counterbalance and inserts. 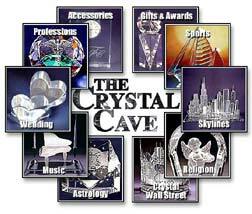 Dealer of antiques, artwork, specializing in handcrafted jewelry. Antiques & Porcelain by G.K. Ltd.
Offer a wide selection of beautiful & unique pieces. Specializing in Meissen Porcelain & much more. 20th century art and design. Specializing in antiques, jewelry and Judaica. Fine antiques and fine furniture. Antique lighting, polishing, repairing, and plating. We specialize in chandeliers of all types and sizes. Dealer of antiques and collectables. Dealer of art and collectable antiques. 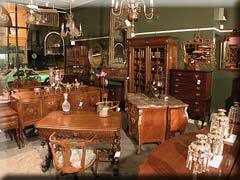 18th and 19th Century English antique furniture and accessories. Fine Chinese porcelain and American oil paintings. Fancier of unique furnishings, antiques, artwork, fabrics & interior/exterior design services. Specializes in antique mahogany furniture. Rare antiques and American collectables. Specializing in buying and selling antique clocks, watches, barometers and music boxes. For over 30 years The Collected Works has been committed to restoring and selling classic hand woven wicker furniture made by American manufacturers 1850-1930. From Victorian to Art Deco, our shop has a wide variety of properly restored wicker pieces to suit any decor or desire. During the 1890s, wicker manufacturers competed with each other to come up with innovative and distinctive furniture styles. Over 100 years later those pieces have withstood the test of time. Quality construction as well as properly proportioned designs, have left us with exquisite examples of the wicker craftsmen's artistry. Manufacturers such as The Heywood Brothers & Wakefield Co., A.H. Ordway, Colt Willow Ware Works, Karpen, Jos. P. McHugh, Ficks Reed and Gustav Stickley, to name a few, are all known for their distinctive designs and are synonymous with quality American wicker furniture. Today these pieces are highly sought after along with skilled craftspeople to provide expert and proper restoration. The Collected Works also carries iron beds, garden furniture & accessories, antique & vintage toys and quilts made between 1850-1940. 17th and 18th century antiques. Country furniture, folk art and gifts. 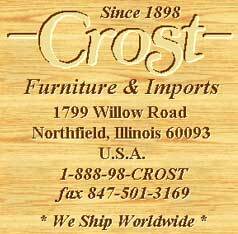 Period antiques, exclusive made-to-order furniture, unique giftware and accessories from around the world... there's something for everyone at Crost Furniture and Imports. Our cabinetmakers in the U.S., England, Ireland, and the rest of Europe use old timbers to construct our antique copies. New reproduction furniture will be made from renewable forest resources or farmed trees. Our furniture finishes, whenever possible, will be environmentally non-toxic. In keeping with our values, we will continue to make special efforts to seek out decorative accessories and gift items that benefit the environment and the world community. There's no telling what treasures you'll find. Click on our special of the month. Take a virtual tour of our showroom. Click open any one of our drawers below and explore! Collector and dealer of antiques and rare collectables. 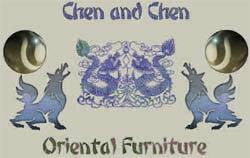 Mainly European furniture and upholstery. Native American art & jewelry, weavings & baskets from 1940 to contemporary, as well as new items. Restoration, refinishing of antiques & custom work. Fine antiques, oil paintings, porcelains, and rare imported furnishings. Nostalgic and antique furnishings, design, consultation, remodeling, additions, fireplace matels and antique lighting. Paper ephemera, Chicago items, character & other collectibles, and advertising pins & signs. Custom wood furniture and restoration. Traditional American & European Furniture. Gorgeous dining room sets. Evanstonia Antiques & Restoration specializes in 18th and early 20th century fine traditional American and European antiques. We offer an extensive selection of dining room tables, sideboards, occasional tables, chair sets, china cabinets, breakfronts, desks, library tables, console tables, secretaries, dressers, lighting, paintings, mirrors and much more. We carry top manufacturers such as Baker, Kittinger, Kendel, Berkey and Gay, Tobey, John Weddecomb and Stickley Brothers. All pieces beautifully displayed in two showrooms. Evanstonia Antiques and Restoration opened its doors in 1987 at 702 Main St. in Evanston, IL. Owner, Ziggy Osak began with one philosophy and carries that same philosophy with him today, which is to offer fully restored good quality traditional antiques. In 1993, Evanstonia opened its second store at 4555 N. Ravenswood in Chicago, and 15 years later, we are still going strong. 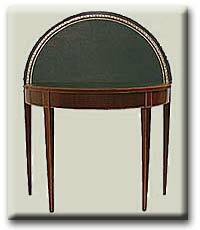 American furniture from the 1780's-1830's with an emphasis on the classical taste, period accessories and works of art. The Federalist Antiques, the Midwest's most respected dealer in American furniture of the Federal Period, is dedicated to preserving the unique qualities of America's early craftsmanship. The Federalist Antiques gallery focuses on providing fine examples of period American craftsmanship at fair and reasonable prices. The experienced collector knows these qualities are not present in contemporary reproductions. 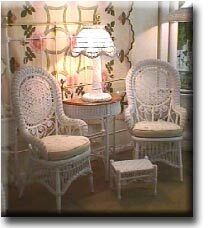 Other services provided by the gallery are restoration of damaged antique furniture and custom design work. The Federalist also accepts consignment merchandise and offers appraisals of period antique furniture and accessories. Restoration, carving and fabrication, custom design. A unique and charming gallery, FolkWorks features one-of-a-kind American folk art, country antiques, hand-painted furniture, and eclectic decorative arts. Creations by artists from across the country are showcased in an exciting new thematic show each month. We invite you to stop in and discover our treasures for yourself! You can find us in the vibrant Chicago/Dempster shopping district in Evanston, Illinois.